These two bats were roosting in a place I have been visiting for moth photos. Not a single moth was on these walls on this day, just the two bats.Obviously, they are very efficient at insect control. 4.33 to 5.12 inches including tail, average wingspan 12.99 inches. Habitat includes woodland and urban areas, being nocturnal, they roost in the day in buildings, caves, mines, rock crevices, and trees. They are often solitary, but may congregate into small colonies during the spring and summer. Females give birth to one, possibly two, young in late spring. They eat flying insects, especially beetles. They usually forage just after sunset, often over water, near trees, or near artificial lights. 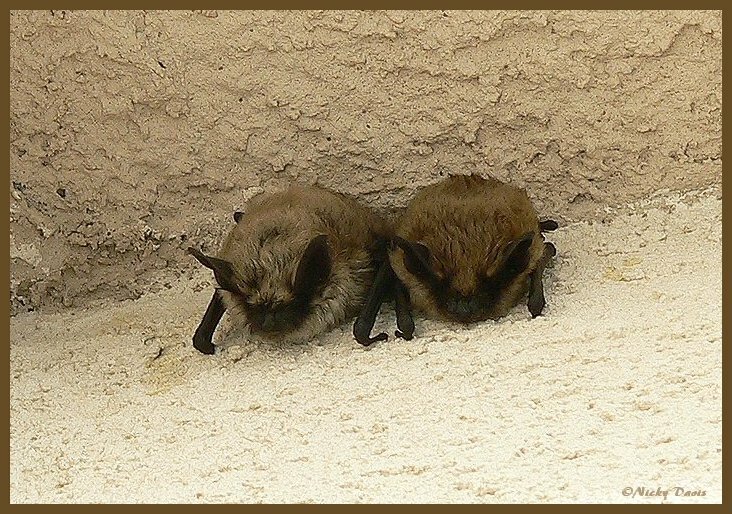 Although some big brown bats may migrate to escape cold weather, most individuals hibernate during the winter months.